The eight teams that are progressing to the UEFA Women's Champions League quarter finals have been confirmed and here’s how and who got through. This tie was one of the finely balanced ones after a 1-1 draw in the first leg. In the previous year when the two teams faced each other in the round of 32, the first leg was a draw too. That year LSK had comfortably won the second leg. History repeated itself as they once again beat Brøndby in Denmark. In a close game that the hosts dominated, LSK took had to sweat but found the goals they needed in the last 20 minutes. Anja Sonstevold and Synne Skinnes Hansen both finding a way through the home defence in the space of eight minutes. The win puts an end to a nine-year wait for Toppserien representation in the last eight. Lyon are the current champions and they showed their class and prowess against Ajax. The previous leg ended 4-0 so they had all but booked their way through, however, they weren’t going to mess around in the second leg. Early on, Delphine Cascarino opened the scoring and doubled the lead within a few minutes. Wendie Renard added her own quickfire double later on in the first half and sent Lyon into break four goals to the good. With almost an hour on the clock, Ada Hegerberg added to her own impressive tally which is currently 41 Champions League goals. Griedge M’Bock Bathy, Amel Majri and Lucy Bronze all scored with Linda Bakker chipping in with an own goal. Gintra Universitetas. Bayern had won the first leg 2-0 with the goals coming in the first half. The first goal here was crucial to confirm their spot. It came in the 42nd minute from Sara Däbritz, her first goal in this campaign. Jill Roord and Dominika Skorvankova both scored late to see off the Swiss side. Chelsea have been finding goals hard to come by in the league recently but came into this match on the back of their second win in the league. Drew Spence opened the scoring with a great long range effort. Stilted in the league but in fine for on the night, Fran Kirby was clinical with her first UWCL hat-trick which included a penalty after Ramona Bachmann was taken down in the box. 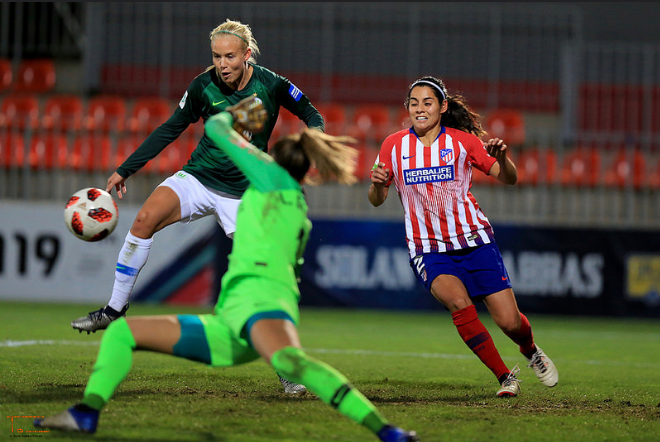 Stephanie Öhrström had an amazing performance in the first leg but unfortunately things just didn’t go right on the night for her or the team. Both Erin Cuthbert and Bachmann scored to make it 6-0. Blues fans will now be hoping they take this kind of form into the league. PSG had the upper hand coming into the second leg after winning 2-0 in the first leg, it was a close second leg however. PSG took the lead through a Maja Kildemoes own goal 30 minutes in and shortly after, doubled their lead through Marie-Antoinette Katoto. Linköping weren’t about to give up though as they responded within a couple minutes of the restart. Anna Oskarsson gave some faint hope to the visitors but PSG responded just as quickly Katoto got her second on the night. Lisa Lantz scored for Linkoping to bring them within one but the damage had been done in Sweden. The loss caps off a disappointing 2018 for the former Damallsvenskan champions. Atletico Madrid showed their class in the previous round after knocking out Manchester City, however against an in-form Wolfsburg the Spanish champions have thoroughly struggled. There’s a reason why they have dominated alongside Lyon and after a 4-0 win in the first , they were out to score as many as they could. There was only one goal in the first half with Alexandra Popp scoring it. One minute into the second Caroline Graham Hansen added the second, the winger wrenching open the floodgates. Pernille Harder scored a four minute double with the other goals coming from Kristine Minde and Ewa Pajor. Slavia Praha are no strangers to the quarter finals, Rosengård, however, had gone out in the exact same round as they did here last year. All the work and goals came in the first leg. Looking more to hold onto what they had, Slavia saw off huge pressure from the visitors who needed at least two. Unable to breach the home defence, FCR crowed off a forgettable week as Slavia safely navigated a route through to the last eight. Barcelona had all but booked their place through to the next round at home. They made the trip to a cold Glasgow but were still on hot form. Lionesses manager Phil Neville was in attendance on the night and would have been pleased to see Toni Duggan grab a double on the night with goals coming either side of half time. The third goal belonging to Alexia Putellas.